It will be important for growers who use water for frost protection to utilize best management practices in order to conserve water and decrease impacts on stream flow. This is critical if growers are to avoid fish strandings during frost events and the regulatory penalties under the Endangered Species Act. Growers will only need to contact Ag Commissioner’s office if a change to the frost protection system or owner/operator occurs. Information for growers will be posted here to keep you informed this frost season. Keep cover crops and other vegetation closely mowed to the ground. Moderate or tall vegetation lowers vineyard temperatures at night and increases frost risk. Double-pruning or late pruning will retard budbreak. Conduct the final pruning after the more apical buds have pushed. Use your own thermometer. Frost is very site-specific, so don’t rely on a remote weather station or your neighbor’s thermometer. Measure well away from your neighbor’s vineyard if it has sprinklers in operation. Better yet, use a bulb-type, aspirated psychrometer (wet and dry bulbs), like a Psychro-Dyne, available online ($165) at www.forestry-suppliers.com. The wet bulb is very useful. Portable electronic types are available, but are less accurate at low dew points than are bulb-types. Sling psychrometers may also be used. Use dew point values to determine your threshold for sprinkler start-up. Use a psychrometer and associated look-up tables, if possible. If not, using publicly-available dew point information within your region is better than using nothing. Dew point of 24°F or higher: Turn on sprinklers at 34°F air temp. Dew point between 20 and 23°F: Turn on sprinklers at 35°F air temp. Dew point of 19°F or lower: Turn on sprinklers at 36°F air temp. These apply only when frost is predicted. Turn off sprinklers when air temperatures rise back to 34°F, ice is melted, or wet bulb temperature exceeds 32°F. If using a wet-bulb device, frost control must be active for wet bulb temperatures of 32°F or lower. Wet soil surfaces conduct and store heat better than dry ones. If soil dries out by late spring and frost is forecast, brief irrigations (1-2 gallons per vine) periodically may help. Use wind machines to assist in frost control, where available and applicable. 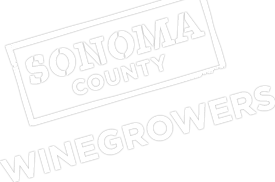 Prepared by Mark Greenspan, Advanced Viticulture, with input from Sonoma County winegrape growers. Snyder, R. (2000) Principles of Frost Protection. University of California Regents. Glen McGourty, Oral presentation. UC Cooperative Extension. Recent rainfall has alleviated the need for early irrigation initiation. Avoid the temptation to begin irrigation, as vines will become accustomed to the easily-extracted irrigation water once it becomes available. Let them use stored water reserves in the soil for as long as possible before initiating the irrigation “season”. Premature irrigation initiation can result in cane lengths that need hedging and lateral shoot initiation that increases the costs of canopy and disease management. Keep an eye on cover crops (if they exist). Deeply-rooted perennial grasses (e.g. Blue Wild Rye, California Brome) will dry up and go dormant when soil water reserves become low. Don’t be concerned, however, when annual grasses and legumes and less drought-tolerant perennial grasses get brown. Monitor soil moisture, if you have devices installed. Soil moisture measurements are very site-specific, so develop a history of soil moisture and use it to determine when the best time is to pull the irrigation trigger. Monitor shoot tips (see below photos). As long as shoots are actively growing (top photo on left), there is no need to irrigate, unless shoots are stunted. Irrigation may be necessary when shoots are slowing down (top photo on right) and need to gain more length before stopping. Irrigation may be initiated when shoot growth ceases (approaches the bottom photo on left). The pressure chamber apparatus may be used as an adjunct to shoot tip evaluation. Generally, shoots stop growing when midday leaf water potential reaches -10 to -11 bars on a mild weather day. Some parts of any vineyard will show signs of irrigation need sooner than the rest. If possible, irrigate those vines with separate, dedicated, drip hoses, before initiating irrigation for the rest of the block. A short irrigation for fertilizer application does not necessitate continued irrigation cycles. Once irrigation is started, apply only the amount of water required to wet the effective root zone. In our climate, we cannot truly “drive” the roots down deeper with drip irrigation. In most north coast vineyards, application of more than 3 or 4 gallons per vine per irrigation pushes water below the root zone. Shorter irrigations can conserve water. Prepared by Mark Greenspan, Advanced Viticulture, LLC, www.advancedvit.com with input from Sonoma County winegrape growers. Growers need to continue conserving water this fall. Mark Greenspan, Advanced Viticulture, suggests the following Best Management Practices for water conservation as harvest approaches. Refrain from using overhead sprinklers for irrigation of vines after harvest (no need to “rinse off” the vines). Use drip irrigation for post-harvest fertigation and irrigation of the vines. Don’t irrigate longer than your normal irrigation. Irrigate as you were before harvest. Vine irrigation is not beneficial if vines are already in senescence. Irrigate only if leaves are green following harvest. Some fertilizers (e.g. potassium and micronutrients) may be applied if vines are not active, but do not apply nitrogen if vines are senescing. Use overhead sprinkler irrigation for cover crop seed germination. This may be especially valuable where there is a greater risk for erosion near streams. Use permanent (self re-seeding or perennial) cover crops to avoid re-seeding every fall.